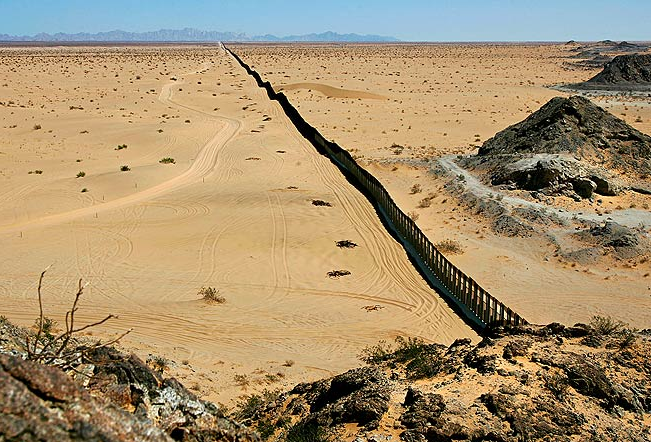 The need for serious immigration reform in the U.S is real, to be sure, but a 700 mile wall fence across a barren dessert valley in the name of national security is … well … insane. Indeed, upon first glance my initial thought was that the photograph above was actually an April Fool’s Day joke, but then I recalled that President Bush had signed an order to start such an enterprise and that the U.S. Congress had actually designated an initial 1.2 billion dollars (of what is expected ultimately to be a 6 billion dollar expenditure) to begin the task. But even still, I had to check to make sure I wasn’t reading The Onion. The photograph marks the absurdity, if not the futility, of such an effort. The wall fence, which looks as much like a crack in the earth as anything, extends from an unidentified “here” to an infinitely distant and unknowable “there.” Its scope is thus hard to imagine, all the more so as we recall that the wall fence itself will only cover one-third of the border dividing the U.S. and Mexico. The viewer is located on the U.S. side looking across the wall fence line into Mexico, but of course we know this only because the caption tells us so since the two sides of the wall fence are equally barren and desolate, virtually and otherwise indistinguishable from one another. The arbitrary and political nature of the boundary between the two nation-states and of the location and exercise of power to enforce the separation is thus pronounced. And more, the very thought that such a physical boundary can be sustained for any extended period of time seems to be mocked by the natural landscape of the desert which promises to encompass and contain all that would disturb its contours. It is difficult to see the poet’s “ground-swell” from this perspective, shot on-high and from a distance, nor are the two-abreast “gaps” that render such structures altogether ineffective apparent, but rest assured that they are there or will soon appear. For historically that has been the nature of walls and fences, whether in Berlin or Belfast or Jerusalem or Padua or elsewhere. What they are designed to keep out always finds its way in, and what is being contained always finds a way to leak or leech out. And for all of their failures such structures only fortify and reinforce the obsessive paranoia and fear of the alien that led to their being built in the first place, one more event in a cycle of state driven violence that keeps us from discovering more humane solutions to our problems. The death toll of the Berlin / East German Wall is, strictly speaking, unknown, but 700-odd is a likely figure. Or to put it another way, if that wall had not been there, 700-odd people would not have died. What do you suppose the mortal cost of this wall will be? The General Accounting Office released a report in 2006 titled “Border-Crossing Deaths have Doubled Since 1995.” http://www.gao.gov/new.items/d06770.pdf This is a direct result of border walls, because in many cases people try to go around them and end up in the desert instead of the city that was their goal.